Waterlog has carried a couple of articles in its time about improving damaged stream habitat, which have left me with a thirst to know more – a thirst which is partially slaked by this volume. 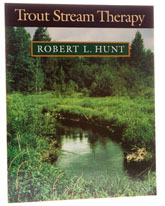 The author is a retired Wisconsin Department of Natural Resources fisheries research biologist and has extensive experience in how to improve streams at modest cost, this large format paperback being a distillation of his know-how. Although there are only 63 pages of instruction, the text is backed up by some excellent illustrations and judging from what can be seen, the author was a master at creating natural looking streams that just make you want to go fishing. My only criticism is that the book should be four times as long, because I still want more.